National Transportation Institute (NTI) released a supplement to its Quarterly National Survey of Driver Wages report, published in March, in response to rapid movement in driver pay. Due to the extreme volatility in driver pay at the end of the quarter, NTI has issued a supplement with updated data to provide subscribers with clear, actionable and current data on industry trends. NTI’s quarterly survey reports findings for the prior quarter and contains vital market insights for fleet executives, insurers, consultants, carriers, shippers and transportation equity analysts alike. “Driver compensation is changing faster than it has since 2015. We’re seeing unprecedented movement in driver pay and we wanted to provide our subscribers with the most current and relevant information,” says Leah Shaver, NTI Chief Operating Officer. According to the Q1 2017 supplement, the trucking industry is experiencing unusually aggressive and volatile movement in driver pay, which is evidence that the market is headed into a significant driver shortage that has all trailer types struggling to find drivers. According to the Q1 2017 supplement, the average per-mile pay increase is currently at $0.029. Each quarter, the National Survey of Driver Wages provides its subscribers with in-depth comparisons of over 500 national and regional pay packages across 75 specific categories. This gives fleet executives the added ability to drill down on trends in per-mile, hourly and accessorial pay, bonuses, 401(k) plans and other benefits, rider policies, driver down time, and much more. As a result of this rapid market volatility, maintaining a competitive driver compensation package has never been more important for truckload carriers. 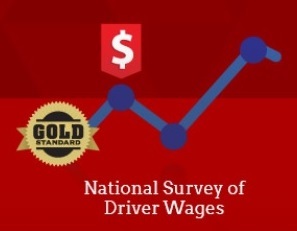 The National Survey of Driver Wages is the gold standard of compensation research for fleet executives, insurers, consultants, carriers, shippers and transportation equity analysts. Based on proprietary research tracking more than 70 unique attributes, the quarterly report enables its subscribers to benchmark key industry information on driver compensation, accessorial pay, bonuses, benefits and corporate policies from private fleets, public and privately held for-hire carriers.